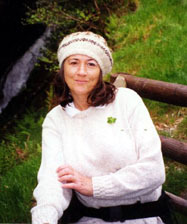 ~ The following was published in The Floyd Press on March 27, 2008. Those monthly Scrabble games I’ve been playing with friends at the Café Del Sol have paid off. I was one of three players from our informal group representing Floyd in a Scrabble Tournament to benefit the Literacy Volunteers of Roanoke this past Thursday. With a score of 458, Virginia Nathan, a literacy volunteer; Chelsea Adams, a Radford University writing teacher; and I played as a team and earned a first place prize for one of the two games played. More than one-hundred players filled Fitzpatrick Hall in the Jefferson Center for the 3rd annual competition, hosted by the Literacy Volunteers of Roanoke Valley and the Roanoke Library Foundation. The games were played in two teams of three with two rounds lasting forty minutes each, just enough time to use all the letter tiles if we adhered to the three minute time limit for each play. For a $30 entry fee, the fundraising event included two games, a light supper, and desserts. A member of the Literacy Volunteers made introductions and announced the game rules from the podium stage. Shanna Flowers (pictured to the right above), a Roanoke Times columnist, was our gracious master of ceremonies. The pre-game atmosphere was festive, but once the games commenced the pressure was on and everything but the task at hand faded into the background. Immersed in our team huddles, we were playing against the whole room for the best score. At our Floyd café games an occasional play might take as long as ten minutes. In this case we had only three minutes, but, working as a team, we had three brains between us. Virginia, the calmest of our group, sat in the middle, adjusting the tiles while listening to input from Chelsea and me. Chelsea kept score and I drew the letters from the drawstring bag, which I had to do quickly. During the first game my hands shook as I placed the seven tile letters on our rack and tried not to drop them. By the second game, we were all more confident in our abilities and teamwork. In between games, we socialized with other word lovers. There was a strong showing of employees from the Roanoke Times, one of the tournament sponsors. All of the six players on the teams we competed with were from the Times. George Kegley, a retired business editor for the Roanoke Times, was the evening’s official Scrabble judge. Some teams boosted their team spirit by wearing matching clothes. 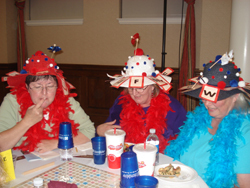 One group of three women stood out, with feathered boas around their necks and large floppy hats with letter cards attached to them on their heads. T-shirts with words and Scrabble logos were worn by some players and volunteers. Dictionary look-ups were allowed but cost an additional $3 donation. 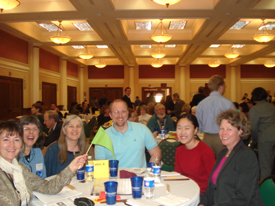 Every table was equipped with a Scrabble board, a timer, and three colored flags. With a wave of a yellow flag a volunteer would appear to assist with a dictionary look-up. A red flag brought the Scrabble judge to determine if a “challenged” word was acceptable or not. A green flag could be waved if players needed rules clarified. I learned from my teammates that JENNIES are female mules. It was a word that could have scored us a Scrabble Bingo worth 50 bonus points if we had found a place on the board to play it. LATHER, JAILED, QAT, ZEES, TOKEN, and RODEOS were some of the words our team put down. We were able to make as many as three words in one play when we played a word that attached to existing ones on the board, expanding on them. Our prize for the best score of the second round was a $50 gift certificate from Barnes and Noble for each of us. Prizes for the lowest team score of each game were copies of the Official Scrabble Player’s Dictionary. A prize for the most interesting word, HALOGEN, was a round of golf for four at Westlake Golf and Country Club in Smith Mountain Lake. The best team name also won a golf package. Some of the team names this year were Victorious Secrets, Word Warriors, The Tilettes, and “Surely, This Name Will Win the Name Contest.” The award went to the Chixtionaries. At the close of the evening, Virginia, Chelsea, and I (aka Two C’s and a V) struck up a conversation with a fellow player about the 2008 National Scrabble Association’s Tournament, which is being held this summer in Orlando. I don’t know if any of us will ever make it to National Tournament, but I’m pretty sure we’ll all be back in Roanoke next year for the Literacy Volunteer’s 4th annual tournament. In the meantime, maybe we’ll purchase some books about Scrabble with our Barnes and Noble’s gift certificates that will help us improve our game. Post Notes: More information about the Literacy Volunteers of Roanoke can be found at www.lvarv.org/. Literacy Volunteers of the New River Valley’s webpage is www.lvnrv.org. The first photo is of, left to right, Colleen, Chelsea, Virginia, and Shanna Flowers. Read “Bag Ladies Ready for Tournament” HERE. I thought you were going to leave 1000 comments!!! Wow! What fun! I play it on Facebook. Michele sent me. There are really not enough people campaigning for literacy in the world. Look at you Miss Thing. Being a word smith and poet have finally paid off. congrats. Hooray for Floyd! I am going to have to find a Scrabble group here in Raleigh. That sounds like so much fun and right up your alley. Did they have it last year? As someone who’s spelling-challenged, I admire those who play Scrabble! Colleen this looks so exciting. All those people, I would’ve been a bundle of nerves. How did you guys finish? It sounds like your scores were high? There were only two games. We finished best in the room for the second game and won the first place prize. The first game I think we got 353. Did you read the part about my hands shaking? I was a mess for the first game. We were so pumped to win! sounds like a perfect scrabble-lover’s event! competition is always more fun when it’s for a good cause. I am so crazy. I missed that you guys won! Congratulations. I just figured you were dizzy with your birthday.